I've been having hot start problems since I replaced the original Solex carb with a manual choke Weber 32/36 about 6 months ago. My '76 is stock, except for being fully de-smogged (with original distributor - advance only, no retard) and the Weber. Carb has the phenolic spacer. It runs great in ALL conditions, except when cranking after sitting 20 minutes or more when hot. Then is turns over but takes a while to fire, and it runs a little rough at first. The Blue coil and fuel pump are fairly new and seem to work fine. Car idles fairly smoothly, and the plugs are that nice light brown. There's a touch of smoke when decelerating and upon initial acceleration from a stop. Chapter 1: New plugs, points, condenser, rotor, cap, air and fuel filters. Adjusted carb idle. Checked/set timing. Chapter 2: New plug and coil wires. Installed Pertronix (seemed to add a little zing!). Checked timing with light and dwell meter. Adjusted valves. Checked fuel tank vent system - no vacuum issues. Checked and adjusted carb float. Replaced rusty charcoal canister. Chapter 3: Now what, Car Talk? I would try try going back to your old black coil. If I recall, the blue coil has higher resistance, so people that have resistors inline to them (75's & older), remove them when using the blue coil. (someone correct me if that's wrong) Your 76 has resistance built into the actual wire going to the coil, no resistor to remove. also, make sure there's a thin wire still connected to your starter solenoid. It's a Spade connector, slide-on. some times that gets knocked off. It runs to your coil. It sends 12V direct while starting, for hotter spark. When your starter is no longer turning, your voltage comes from the wire that has resistance built into it. Also, make sure you do not have a resistor added in line to your coil. '76 models have resistance built into the wire going to the coil. I think You need that extra voltage to start, especially after it's s been running. Hard hot starts are usually from vapor lock or the fuel getting too hot. Check to make sure the fuel lines are routed well and away from heat sources. I have both a ' 75 and a ' 76 and I'd begin by following sislane's suggestions. Trace the "resistance" wire back toward the fuse block. About a foot short of the fuse block it has a transition back to regular wire. At that point, if you want to stay with your blue coil, you can splice in to that wire and run just a std. 16 ga. wire over to the coil. That's what I did years ago on my ' 75 when I went to a blue coil. Still have the OE resistance wire on my wife's ' 76 because we still run the black coil on it. Thanks, everyone - a lot of excellent ideas. Regarding wiring, I did bypass the "in-wire" resistor (or ballast) when installing the blue coil. Unfortunately, I either sold or trashed the old black one. But before getting a new black one, I'll try the other suggestions, especially that solenoid/coil wire. Read on . . . Here are a couple of pictures of the solenoid and blue coil connections. I ALWAYS WONDERED what those wires were for!! The spade on the solenoid was actually covered with a black rubber cap. It's the small shiny one just to the left of the yellow Bosch label, right? And there's the loose wire, right there just waiting to be connected. Now, at the distributor end, you'll see the plastic connector, but one wire has been cut. Do both of those wires connect together and then to the disctibutor? Positive side, right? 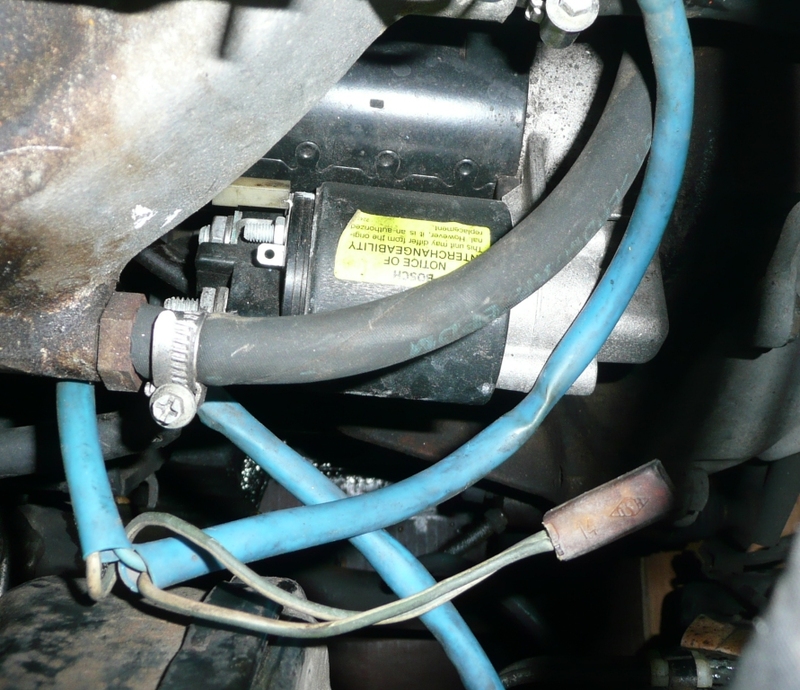 Next, I'll reposition the fuel filter, as I've noticed that it DOES drain back. Why hadn't I thought of that? Also, the fuel hoses (most of which are fairly new) have been routed away from heat sources, but I will double check that. If all this works, great. If not, I'll look into the new black coil and new fuel pump and rubber fuel hoses. I believe we're on the right track! I'll report on my progress. and one day when I drove my 69 right after driving my '73 I realized that the 73's starter cranked very slowly when the engine was hot. Checked the battery and it was fine, so I swapped another starter motor into the '73, and that solved the problem. It still cranks a little longer hot than cold, but with the faster spinning starter motor, it fires right up. As already pointed out, it's the vapor lock problem... Just ask the Opel crowd. Also, describe your smoke upon take off problem. I am having very similar issues since I have swapped in favor of the weber. Second, the motor pulls more vacuum with this carb sucking more oil past the valve seals. Did you notice any gray/bluish smoke when you had the solex carb? Ah, the smoke! From what I've read, most all of our little gems do smoke a bit. In normal running there's no smoke. When I sit idling for a while, it begins to smoke some, and then upon take off, there's a little burst of smoke, but that's it. It seems to be about the same as before with the Solex. There is also some smoke when letting off the gas between shifts. It's the classic valve guide seals problem. One day I'll fix it, but it's not a big enough problem to make it a high priority. I don't think it is your issue in this case, but another possible cause for hot start problems is too much advance. With too much static advance you may start up just fine when cold, but when doing a hot start, the starter may turn slowly and the engine not fire. It is easy to check if that is the problem by cranking with and without the coil powered up. Like I said, doesn't seem to fit your symptoms, but if you changed your timing during this time it may be worth a check. The timing adds to the problem for sure. I run 25 degrees at idle myself. Well, everything electrically and mechanically checks out, and I mean everything, but I am still getting reluctant hot starts even with the extra voltage boost wire from starter to coil. HOWEVER, I know the problem now: FLOODING! Someone suggested that I look down through the carb to check the manifold when sitting hot for 20+ minutes to see if there is fuel puddling . . . and there is. 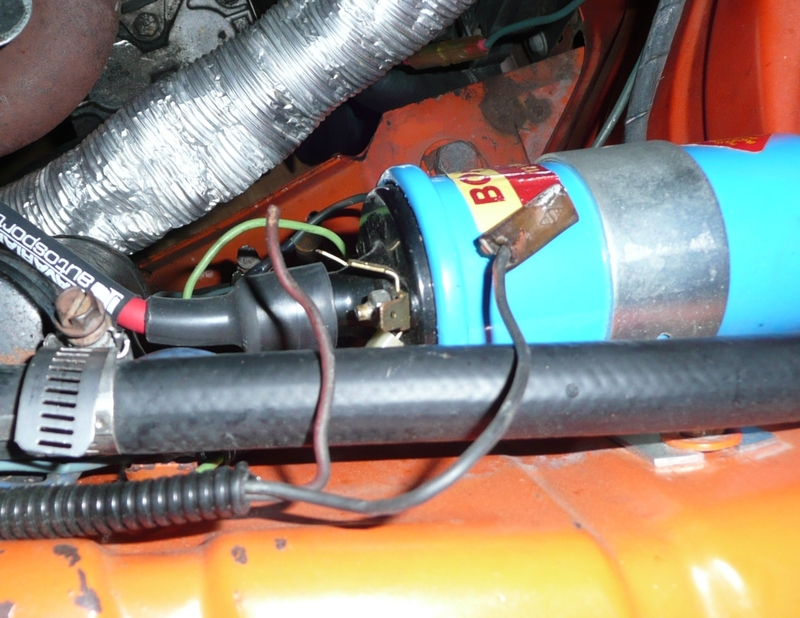 He figured fuel oozed from a Weber emulsion tube into the manifold. So, I guess I am forever required to hold the gas pedal down when hot starting, that seems to help a lot, that is, unless someone has a better idea.